Cape Town - SA's new President, Cyril Ramaphosa, introduced the #TummyMustFall notion on Tuesday morning, 20 February. Following the walk he had led from Gugulethu to Athlone, he said he'd be continuing his walks with citizens around the city and in the townships. President Ramaphosa or now dubbed Runner-phosa encourages SA citizens to kick off their day on the right foot by joining him on his morning runs and walks. Here are some of SA's most breathtaking trails to get your feet itching and your tummy dropping in anticipation. This trail is situated one hour from Cape Town, West Coast National Park. It is probably the most popular place to visit because of how closely located it is to the city. The Geelbek and Bakoor trails offer distances that go up to 9km, allowing you to take in all of the park’s beauty. Nestled in the centre of Table Mountain National Park, there are a few Silvermine routes available that hikers with a particular interest in flora will enjoy as the stunning area boasts fynbos. Try out the popular Silvermine Waterfall Walk - it is ideal for families and you can take your pet along too. This walk is an easy 2 kilometre walk that you can complete in an hour. However, be cautious when close to the slippery edge of the 30 metre waterfall. For more of a challenge, try out the moderate 6 kilometre walk from Silvermine to Noordhoek Peak. This hike will take you about 2.5 hours to complete (including your return) and is combined with an additional loop to Elephant’s Eye Cave, offering a 360-degree panoramic view of the Peninsula. Rearing its distinctly shaped mountain slope head alongside Table Mountain, the views from the top of its kop is truly something to behold. 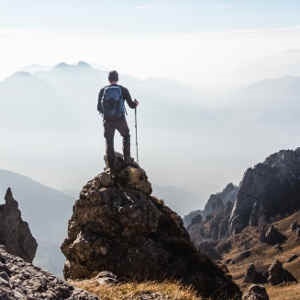 The walk to the summit should take approximately an hour and 30 minutes and can be quite steep at times when hikers reach its rock faced edging. On clear days you have the opportunity to witness an unfiltered beauty of the city in all of its glory, the Cape Peninsula as well as spot Robben Island floating on its ocean bed. On overcast days you are able to observe the beauty of the Cape engulfed in a blanket of clouds. This is a popular spot for hikers to watch the sun rise or set over the Cape. Lion’s Head is the perfect walk for those who want to squeeze in a short hike – with or without the children and the dog.What a spectacular view of the City and the sea.?? Situated on the eastern slopes of Table Mountain, Newlands Forest is a quick 15 minutes away from Cape Town's CBD. This trail is a favourite among walkers (with pets), trail runners, leisurely strollers, serious hikers, nature lovers, picnickers and locals wanting to stretch their legs and let off steam after a taxing day at the office. There are four unique trails that wind up the mountain which range from easy to moderate, and boast several vantage points along the way that offer stunning views overlooking vistas from the city centre to Blouberg. Entering the forest from the parking area, you will come across a sign with information detailing the various routes. The easier routes are made up of interlinking paths, a few streams in between, and beautiful views of the surrounding suburbs. Dogs are welcome as long as owners are carrying an activity permit otherwise they will be fined. Located just 10 kilometres from the centre of Johannesburg and 5 kilometres from Soweto, Klipriviersberg Nature Reserve is open to the public from sunrise to sunset, seven days a week, with no entrance fee. The hiking trails "vary in distance and in degree of difficulty". The Reserve promises that a three-hour hike on the flatter areas "can be completed by most people who can manage three hours of shopping"! "The steeper, hilly areas can be testing for even the fit," advises the Reserve. Situated in Braamfontein, Johannesburg, this 9 kilometre hiking trail is fun and inclusive for the whole family. Immerse yourself with the serene views as you walk along river - which is dotted with birdlife, trees and other wildlife. There is an option to end the trail at Witkoppen Road, but you need to be met there with a vehicle, if you don’t have this luxury you will need to return back along the route you came. Hop on over to this trail located in KwaMahlanga - 10 kilometres outside of Cullinan, Northern Gauteng - which ribbits on for a comfortable 8 kilometres. You will cross streams, climb rocky areas and stroll through lush grasslands. Along the route you will encounter pools and streams to swim in and enjoy as well as a beautiful waterfall where you can kick back and relax, rest your feet and bathe in the beauty of your surroundings. Fruit trees along the trail offer canopies of shade from the hot sun and keep your eyes peeled for small animals along the way. Bring along your swimsuits, cameras and drinking water and find yourself hopping from foot to foot in bliss. The Igwala Gwala Forest Trail starts in Eden Park, St Lucia, iSimangaliso Wetland Park and comes to an end in St Lucia. The trail is 1.5 kilometres long and is colloquially known as lover's lane due to the romantic views this self-guided trail showcases. Starting along the main road of the village of St Lucia, heading via a group of shops, you are led out of civilisation and enter the world of the swallows. You'll know you've made it when you pass the signboard that says 'Silence Please – Trees Growing'. The trail is easy to follow and leads smoothly through the trees of the coastal forest next to the St Lucia Estuary. Enclosed within the Umhlanga Lagoon Nature Reserve, this trail is only 2 kilometres long and is a little slice of nature that includes a wetland, and coastal and dune forest, as well as serves as a refuge for many birds, animals and plants. This trail is easy and family-friendly and offers you the opportunity to gaze upon the various wildlife species that roam there.